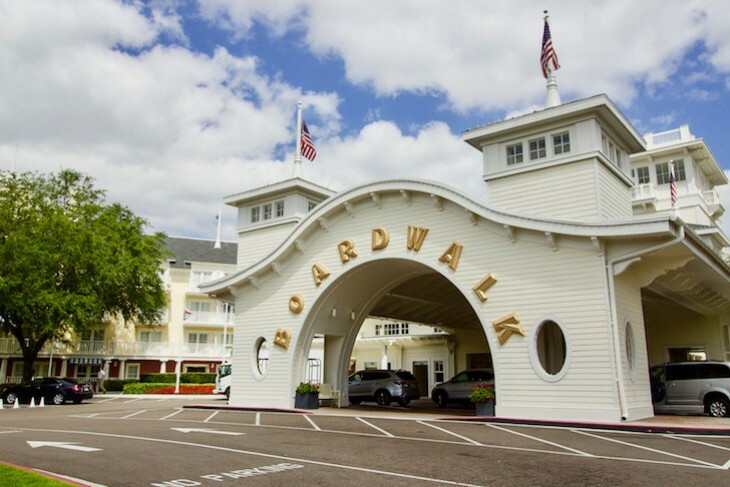 Disney's BoardWalk Inn has anintimate charm which captures the feeling of a 1930s mid-Atlantic seacoast retreat. 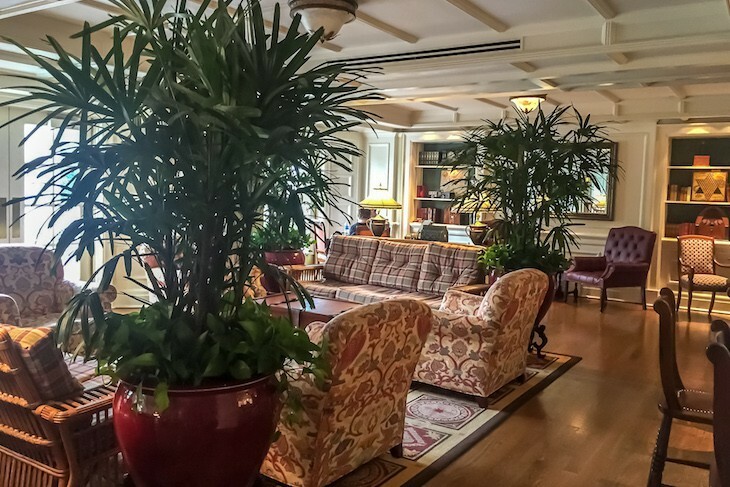 In the lobby is a nostalgic living room scene of chintz-covered, oversize chairs, invitingly plump sofas, and potted palms set atop gleaming hardwood floors and floral area rugs. Looming overhead is a barrel-shaped, chandeliered ceiling embellished with delicate latticework and fanciful carousel chandelier consisting of half horse and half sea creatures finished in 22-karat gold leaf. 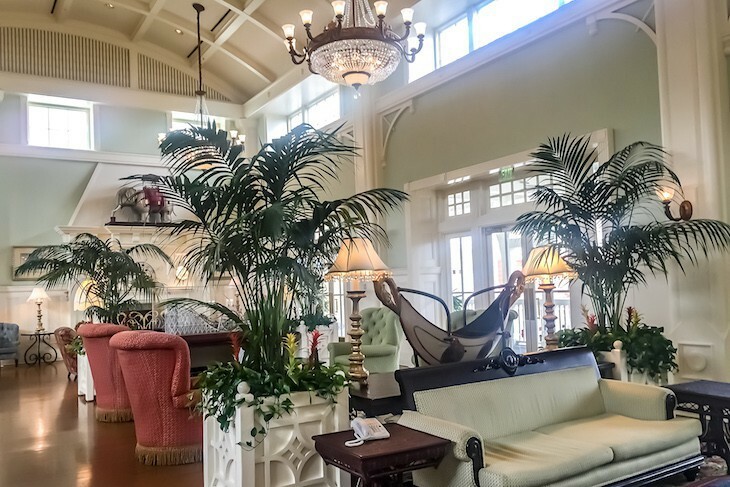 Views from the lobby’s lofty windows are of a courtyard green fronting a festive, old-fashioned boardwalk. 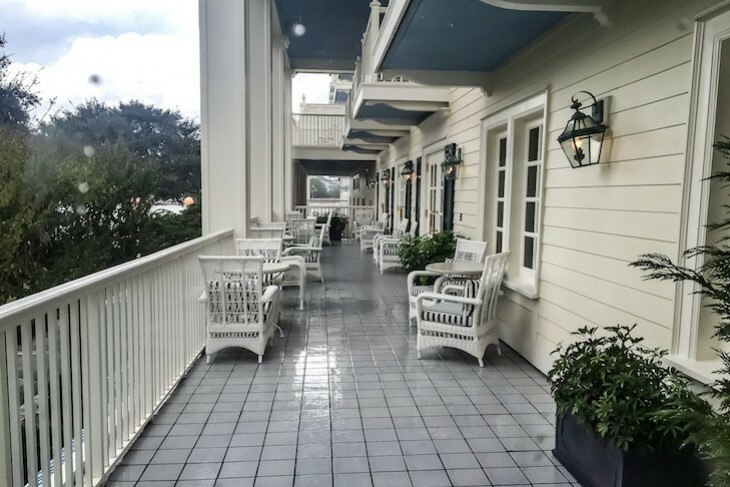 Step outside and have a seat in one of the veranda’s wicker rocking chairs, perfect for bathing in the pink glow of sunset as Disney's BoardWalk slowly comes alive. The resort’s gleaming white, four-story buildings, dotted with latticework and crowned with sea green roofs and striped awnings surround interior courtyards fragrant with blooming roses and crepe myrtle. 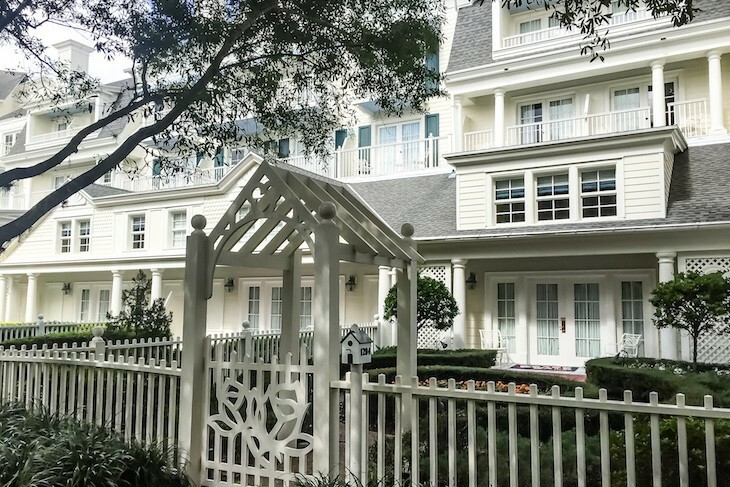 It may be just a short walk away from Epcot’®s International Gateway entrance, but a stay here has a somewhat different feel than other Disney Deluxe Resorts because shops and restaurants are located outside the Inn and lobby area on Disney's BoardWalk instead of inside the resort. 372 rooms. 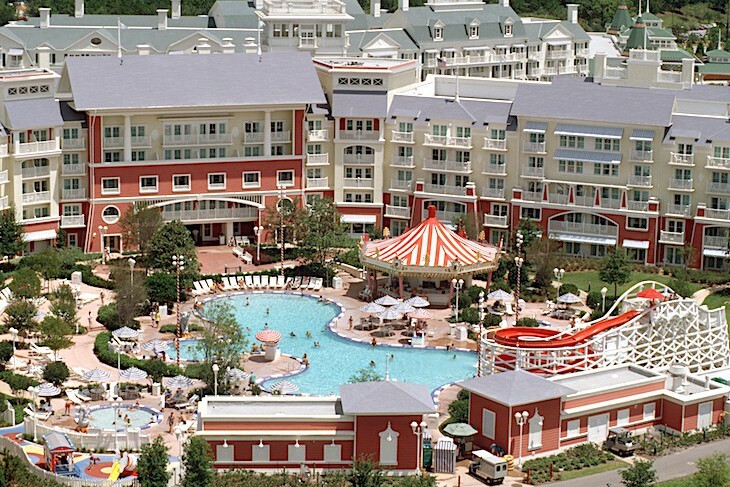 2101 Epcot Resorts Boulevard, Lake Buena Vista 32830; phone (407) 939-5100, fax (407) 939-5150. 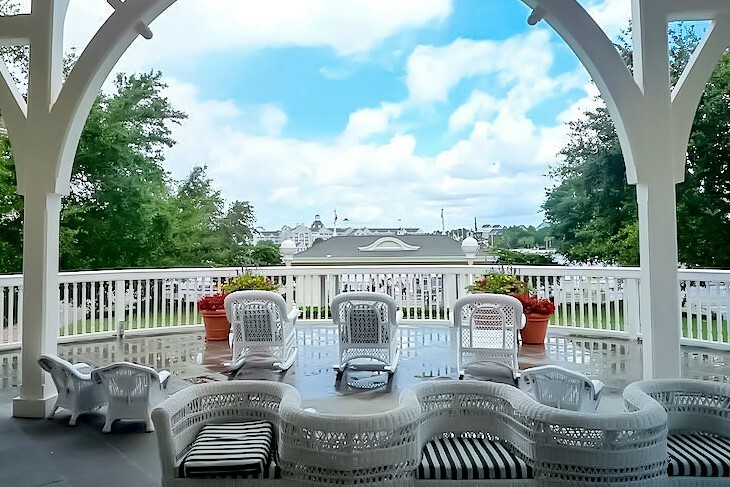 Check-in 3 p.m.; Check-out 11 a.m.
A fabulous deep balcony with sweeping views of Crescent Lake . Two seating areas are perfect for a large gathering. Well-appointed Victorian-style accommodations average 434 square feet, all with French doors leading to full-size balconies or patios. Cherrywood two-poster beds are made with white sheets accented with a multi-striped bed runner. 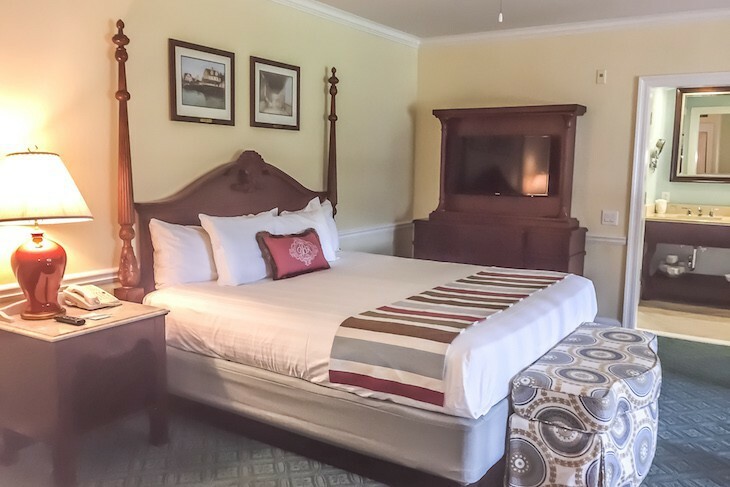 Most offer two queen-size beds (a few with a king bed), cherrywood bureau over which is hung a large TV, and a desk with a Victorian Minnie Mouse lamp. Prints of a turn-of-the-century boardwalk adorn the walls. A cherry colored, flipover single sofa sleeper with sea blue chenille accent pillows, gold and white-striped wallpaper, soft yellow wall paint, hunter green carpeting, and boardwalk motif drapery completes the look. 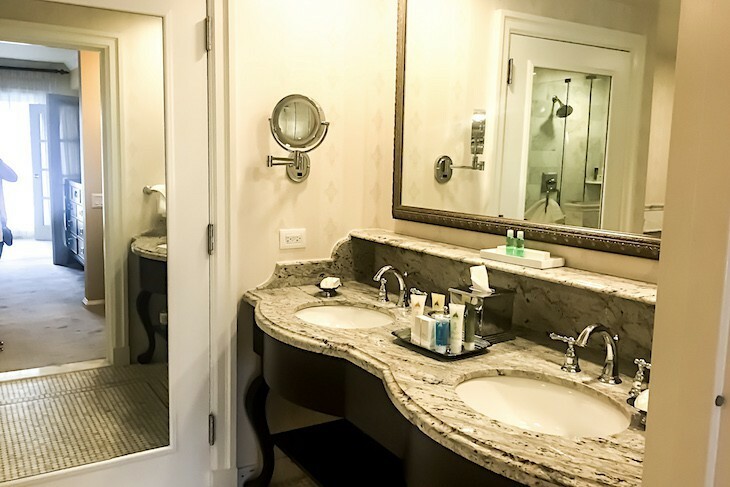 The bath has two parts, each with faux planked flooring: in one area of the bath is a dark wood vanity topped with beige quartz, pewter-hued mirrors, double sinks, hair dryer, full length as well as a lighted makeup mirror. 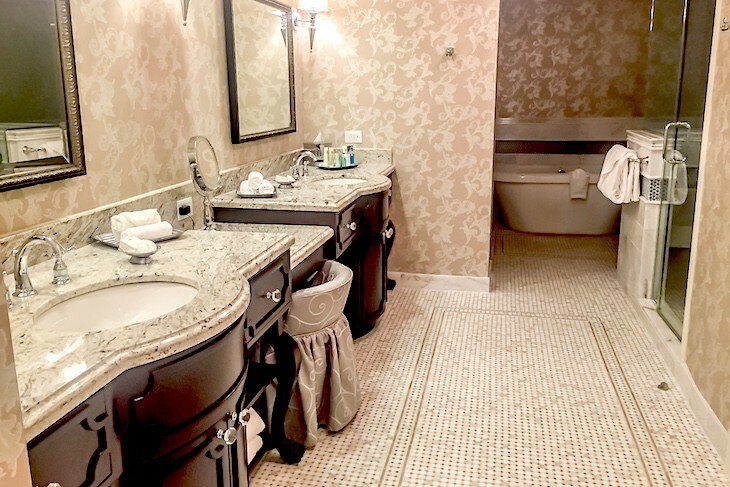 Next to it is a separate commode and a tub/shower surrounded by faux marble tile with colorful bubble tile accents. 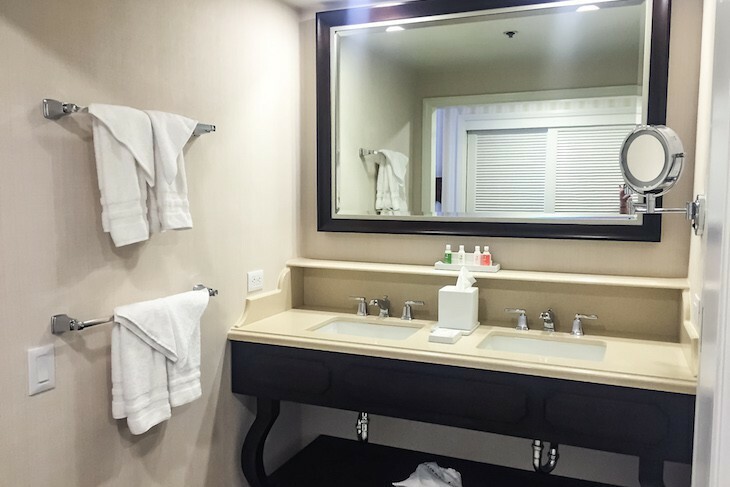 Amenities include H2O Grapefruit Bergamot bath products, keyed wall safe, iron and ironing board, Cuisinart coffeemaker, undercounter refrigerator, and daily newspaper. One complaint is the somewhat dark hallways where lighting is at a minimum. 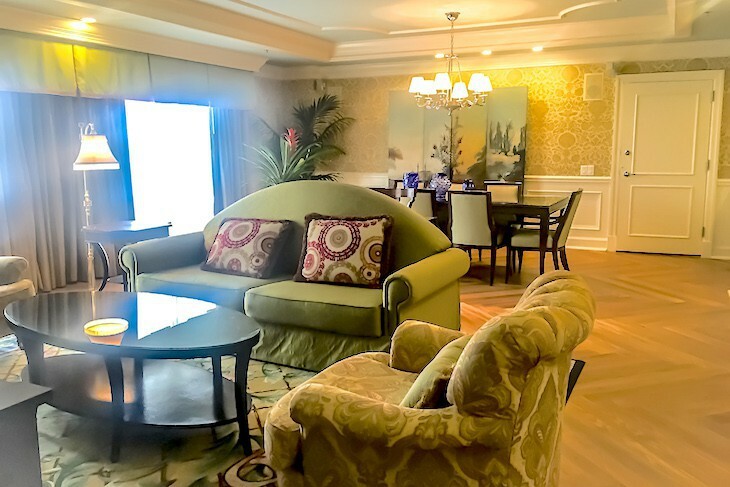 Consider upgrading to one of the 65 concierge-level rooms that come in either a standard view or a Boardwalk view category. 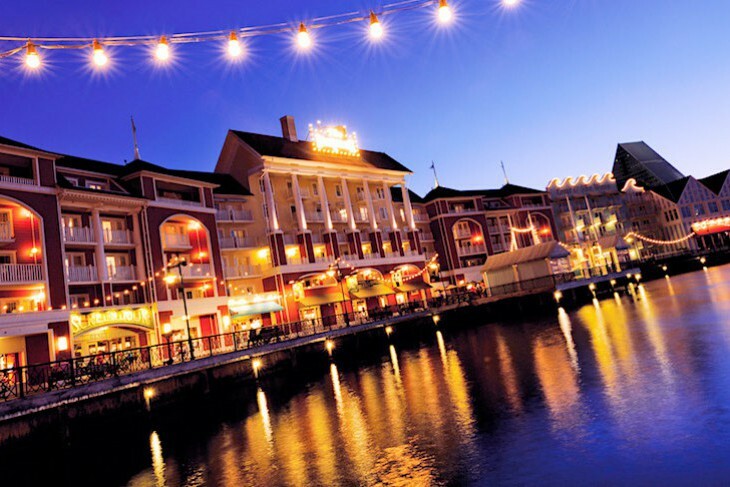 The Innkeeper’s Club lounge on the 4th floor enjoys a super concierge staff and view of the Illuminations fireworks from its balcony. 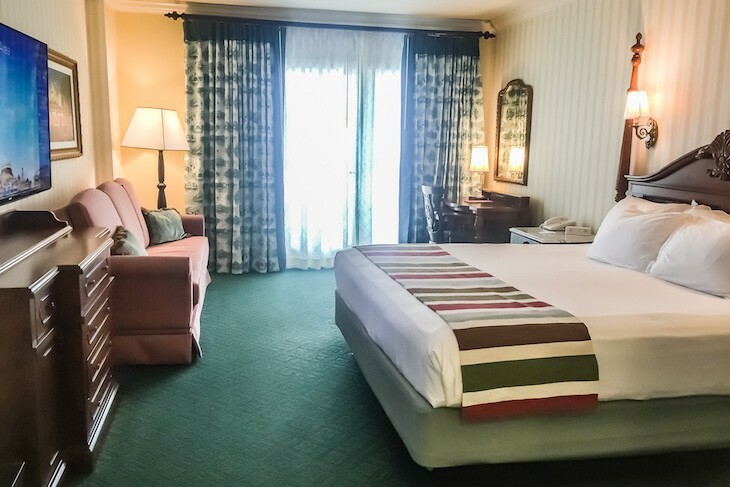 Additional amenities include private check-in and checkout, guest robes, and evening turndown service with a sweet treat of salt water taffy. 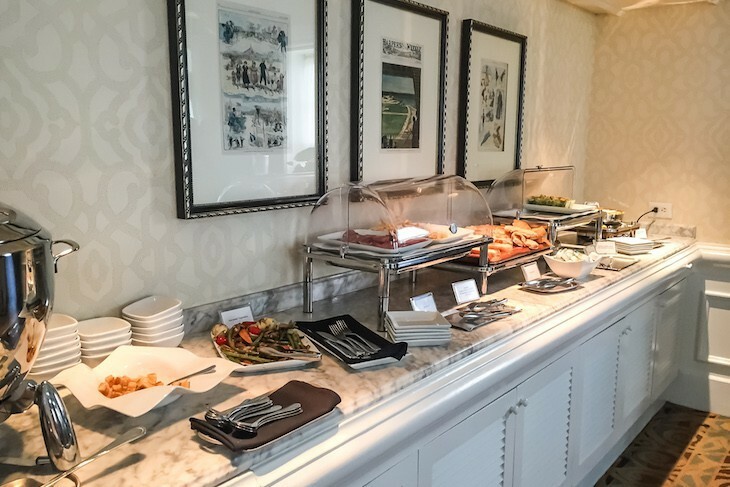 In the lounge, breakfast is fruit, bagels, croissants, mini muffins, pastries, breakfast bread, Greek yogurt, cereal, oatmeal, smoked salmon and fixings, hard-boiled eggs, charcuterie and cheese, juice, coffee, and tea. Midday refreshments are hummus, homemade potato chips with blue cheese and ranch dipping sauce, tea sandwiches, crumb cake, build-your-own trail mix, cookies, fruit, iced tea and lemonade. A refrigerator is filled with sodas and milk. Early evening is an impressive spread including such items as cheeses and fresh sliced bread, vegetable crudités with blue cheese dressing, deviled eggs, roasted tomato soup, creamy potato soup with garnish, marinated vegetables, chicken Caesar salad, charcuterie, baked macaroni and cheese, Yukon gold potato cups with cumin and crème fraiche, mini corn dogs with mustard dipping sauce, braised short ribs, citrus poached shrimp wrapped in prosciutto with grilled pineapple and green onion vinaigrette. Wine is served by an attendant with much improved choices of Fess Parker Chardonnay, King Estate Oregon Pinot Gris, Cannonball Cabernet, Michael Pozzan Russian River Pinot Noir; beer is also included. PB&J rolls and apples with caramel dipping sauce are available for the children. After dinner are cordials and a sweet and savory mix of cream puffs, crumb cake, key lime meringue, oatmeal and chocolate chip cookies, cheeses, house made potato chips, and PB&J rolls. There’s also a self-service Nespresso machine. 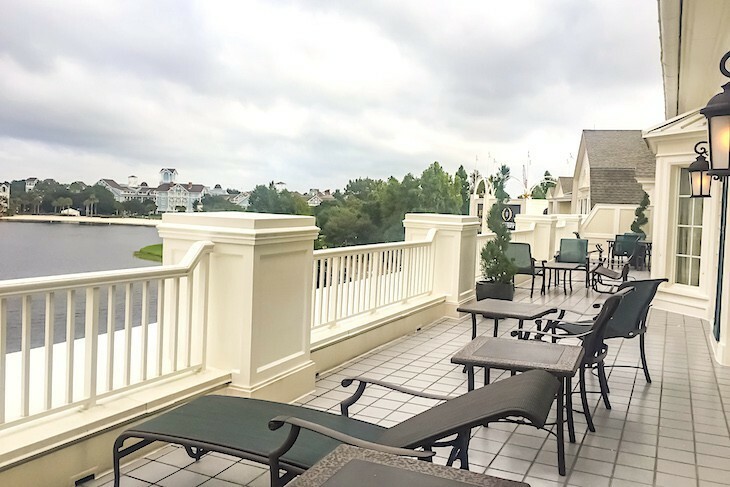 NOTE: They are now including ten standard guest rooms in concierge, but located outside the keyed concierge area on the 4th floor, some with a standard garden view, others with a Boardwalk water view. Not terribly special if you ask me so request NOT to be in one. 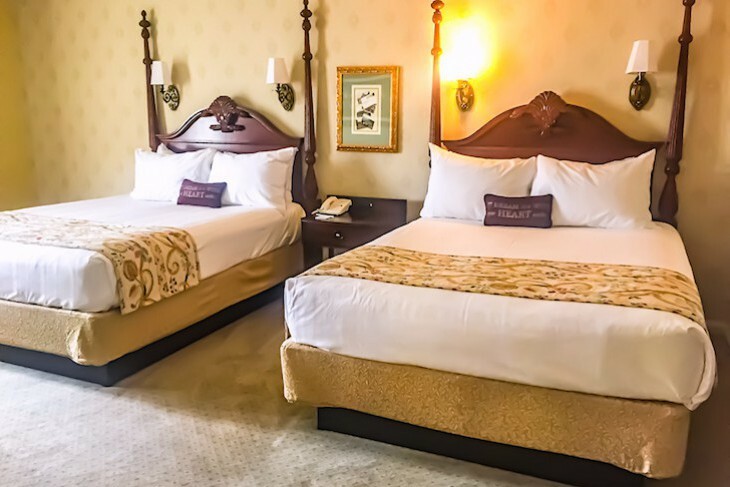 As well as standard-size rooms (six of which offer king beds), the concierge level has ten very spacious, 644-square-foot Deluxe Rooms, all with a spectacular view of Disney's BoardWalk and Crescent Lake, and even a view of the Magic Kingdom® fireworks in the far distance. 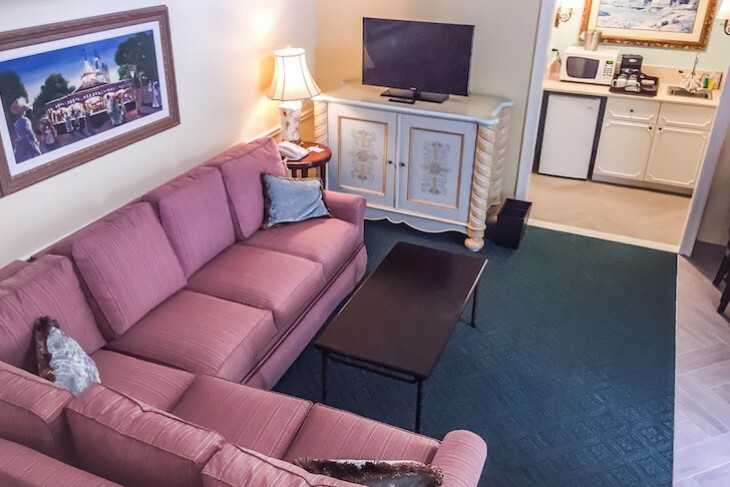 They come with two queen beds, bureau over which is a flat-screen TV, desk, and an open seating area outfitted with a queen-size sleeper sofa, coffee table, easy chair, and extra bureau with an additional flat-screen TV. 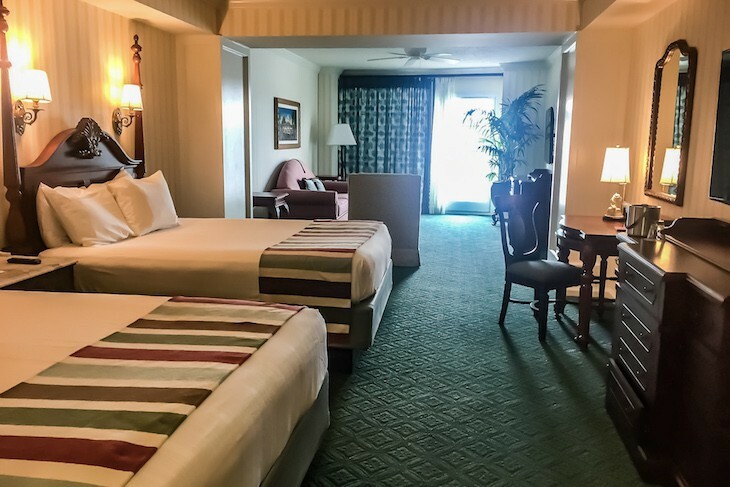 Five Deluxe Rooms are on the 3rd floor and the other five on the 4th floor, but you will find a stairwell nearby for easy access to the concierge lounge for 3rd floor guests. Two actually adjoin, room numbers 3227 and 3229, perfect for families (on request only). A gated, white picket fence encircles the serene, two-story Garden Suites (915 to 1,100 square feet), most with a private front yard complete with rose garden, arbor, mailbox, birdhouse, and porch. Downstairs is a homey living area with a cherry-colored sectional sofa, credenza with a flat-screen TV, coffee table, desk, closet, and half bath. In an alcove sits a wet bar with sink, microwave, coffeemaker, and undercounter refrigerator. Upstairs is a loft bedroom with a king bed, bureau with built-in flat-screen TV, and a bathroom with double sink, oversized tub, and separate shower. 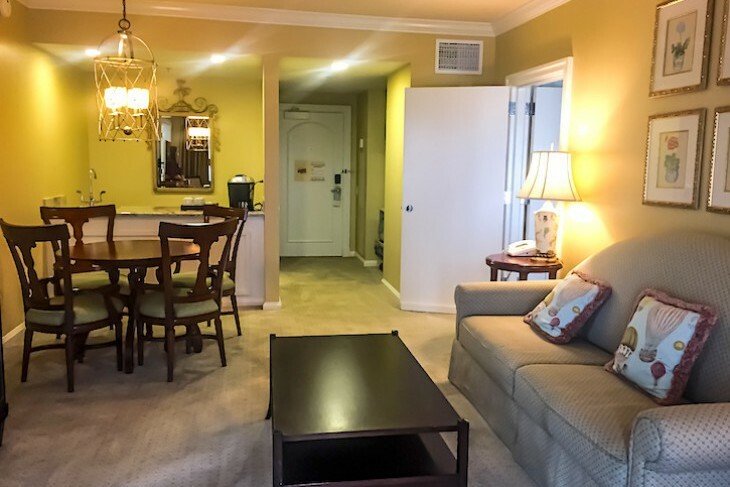 Three of the fourteen Garden Suites (rooms 1205, 1206, and 1207) have an upstairs loft bedroom with French doors leading out to a bonus balcony that overlooks the quiet pool; their living rooms hold a smaller sleeper sofa instead of a sectional. Maximum of two people allowed even though there is a sleeper sofa. Honeymooners should request the unit with the heart-shaped shrubbery. 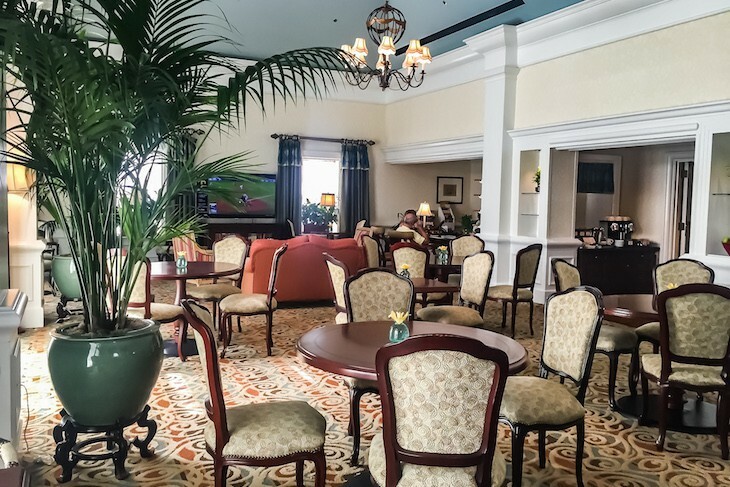 All require walking outside and over to the main building to access the concierge lounge. 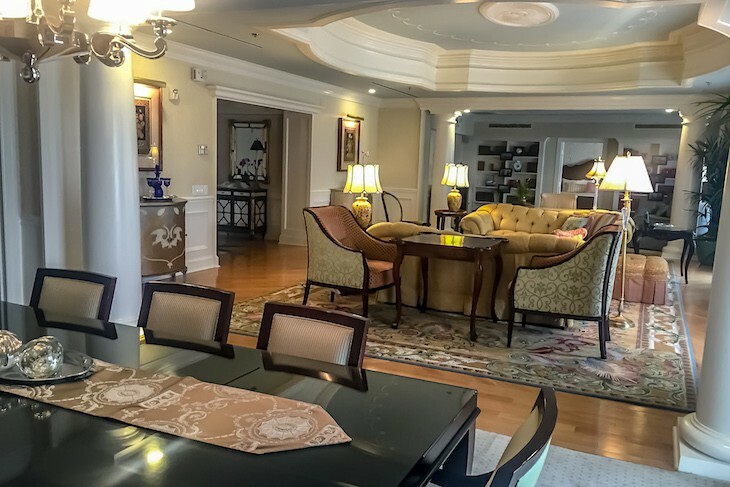 Two-Bedroom Suites with 1,288 square feet offer a small parlor decorated in soft green and gold and furnished with a queen sleeper sofa, coffee table, occasional chair, desk, bureau, flat-screen TV, and small dining table for four. Much needed is additional lighting to brighten up the dark parlor—these are not my favorite suites. There’s also a wet bar with sink, microwave, small refrigerator, and Keurig coffee maker. A half bath and additional bureau is off the foyer. French doors with non-private sheer curtains lead from the living room to the standard-size master with king bed, easy chair, and bureau with flat-screen TV. Leading into the master bath is an open area with an additional bureau and standard-size closet. 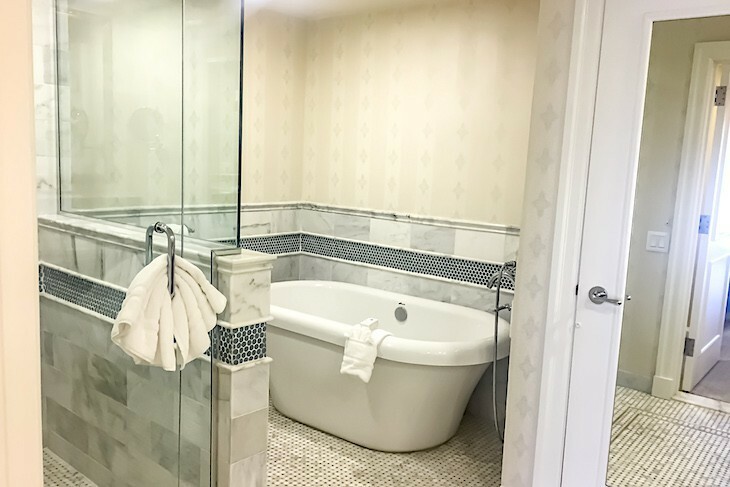 The oversized bath features white mosaic floor tiling, an oversized, freestanding, non-whirlpool tub, separate commode area, marble shower, and double sinks in a taupe granite countertop,. 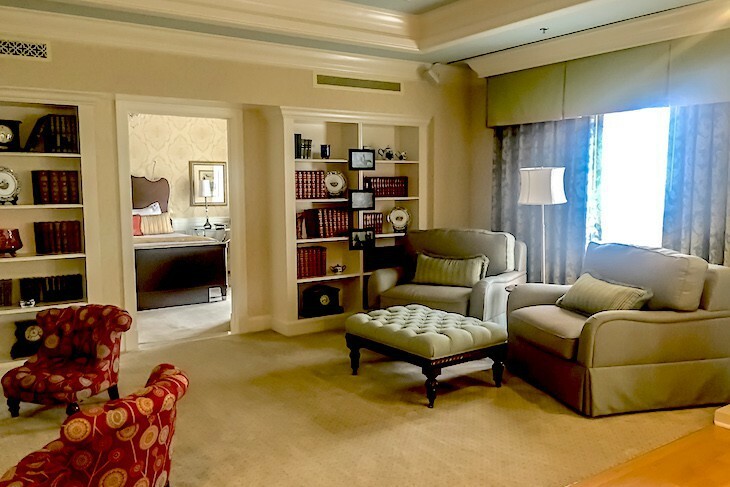 Opposite the living area is a standard guest room with two queen beds and it’s own entrance. There are three balconies, and all have a view of the gardens. Suite number 4205 has a bonus of an Illuminations fireworks view but loses points with its view of a slice of the road; good nighttime view, but not so great during the day. 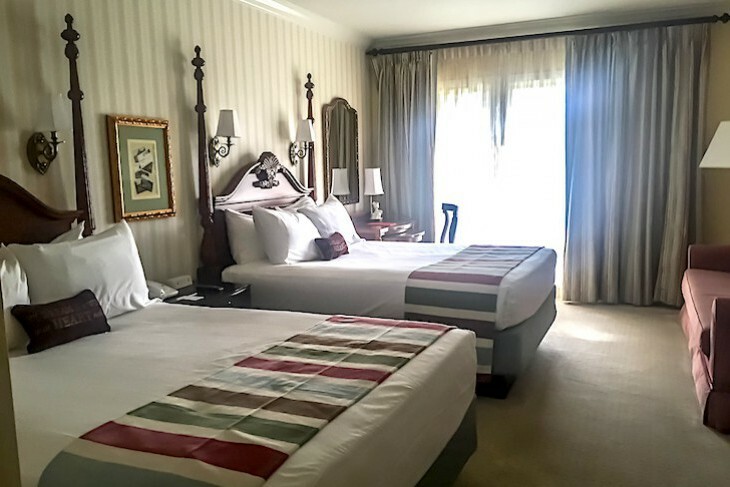 The Vice Presidential Sonora Suite offers a charming Victorian-style in its 1,744 square feet, one that is quite pleasing. Enter the living room from a columned hallway where an area rug sits atop light wood flooring and the décor consists of an olive green sofa accented with touches of magenta in its throw pillows, two tufted easy chairs in a butterscotch palette, and oval coffee table. Behind the sofa sits a desk, and over a dark wood credenza is a giant-size, wall-mounted TV. 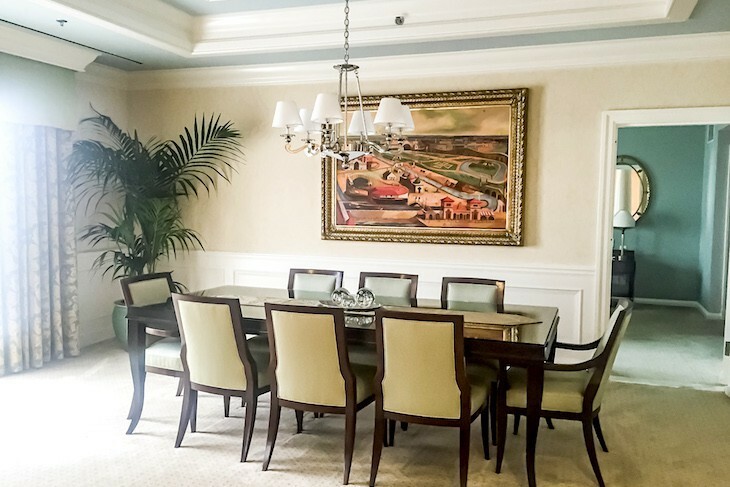 A muraled screen decorates the dining room whose eight-person table is surrounded by sea blue upholstered chairs. Off the entry are a service kitchen on one side and a marble half bath on the other. A shallow stand-up balcony runs the length of the suite from the master bedroom through the living and dining area with a separate balcony off the guest room. 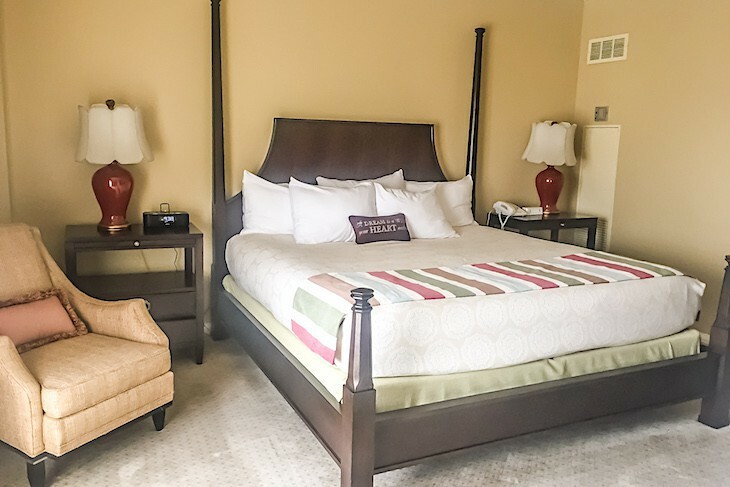 On one side of the living area is an upgraded standard-size guest room with two, 2-poster queen beds and a bath; on the other side is the master bedroom featuring a cherry wood king-size bed sitting high off the floor, bureau with TV, and heavy gold drapery. 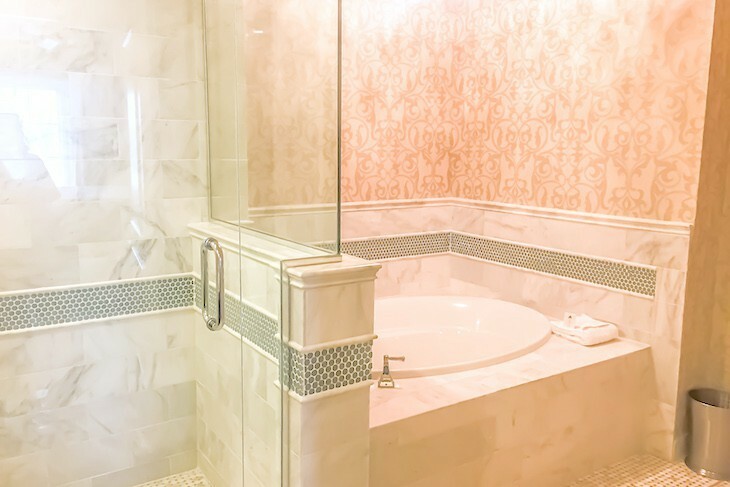 The marble and granite master bathroom comes with double sink, separate shower, oversized tub, and separate commode area, all highlighted with lovely mosaic tile flooring. 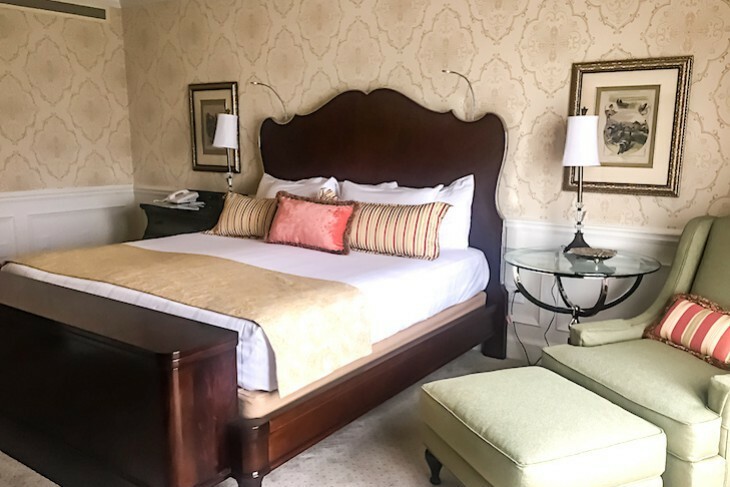 Throughout the suite is Victorian-style neutral floral wallpaper, something that may not be to everyone’s taste, but the outstanding view from the balcony is an all-encompassing panorama of Crescent Lake. 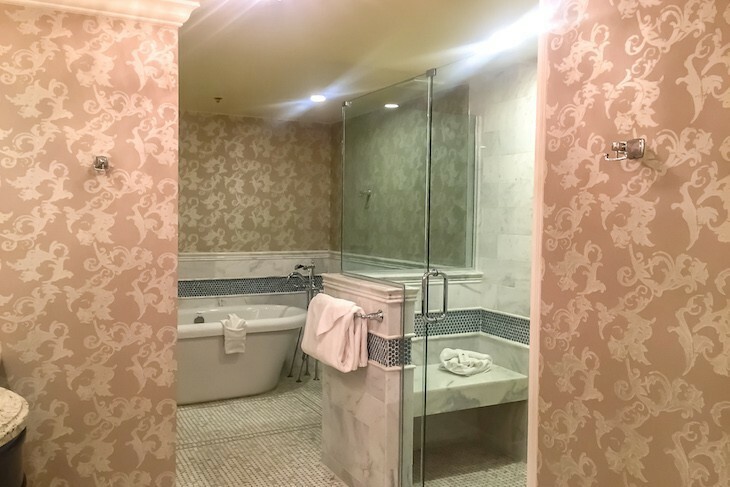 I do like the story behind the suite’s name: Sonora Carver was a woman who had a diving-horse act in the 1920s at the Atlantic City Boardwalk, plunging 40 feet on the back of a horse to land in a tank of water. 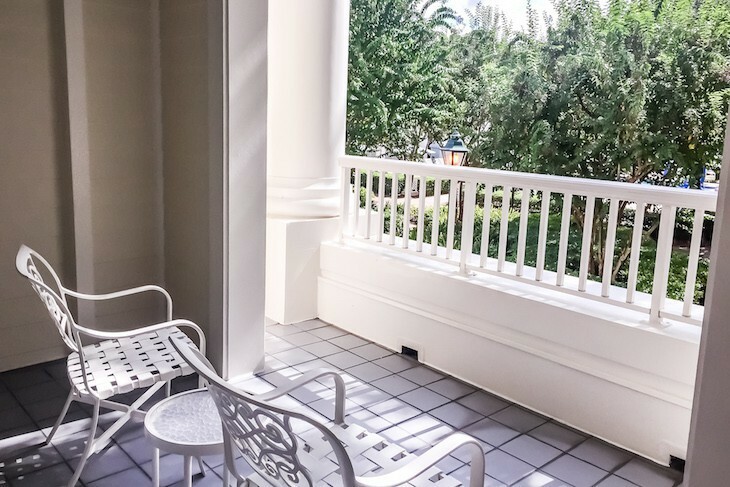 From deep balconies that run the length of the two-bedroom, two-and-a-half-bath Presidential Steeplechase Suite are sweeping views of the BoardWalk and Crescent Lake. This 2,170-square-foot suites offers a Victorian elegance with crown molding ceilings in the massive living room done up in shades of gold, cherry, and olive green. It features hardwood flooring topped with large area rugs and two seating areas: one with two tufted gold brocade sofas, easy chair, tufted seating ottoman, desk, game table and chairs, and a TV remotely controlled to ascend from a cabinet; the other with oversized easy and kid-sized chairs fronting a large TV. 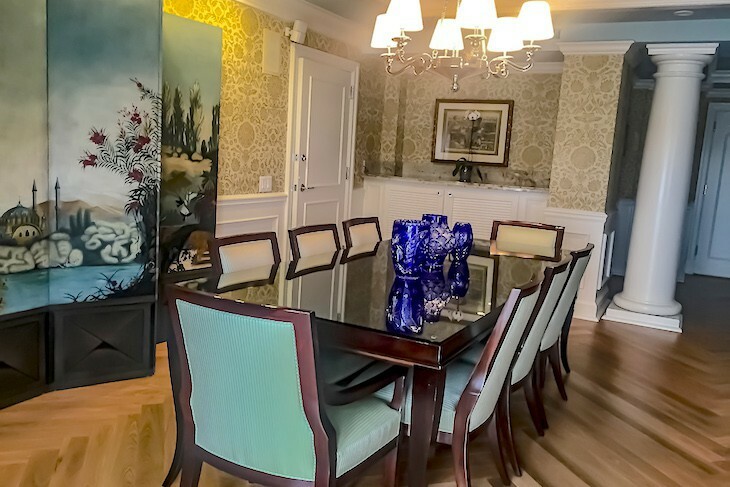 Behind closed doors off the tasteful 8-person dining area with its green and blue striped upholstered chairs and dark wood table, is a kitchen with it’s own service entrance, wet bar, undercounter refrigerator, Keurig coffeemaker, and microwave. 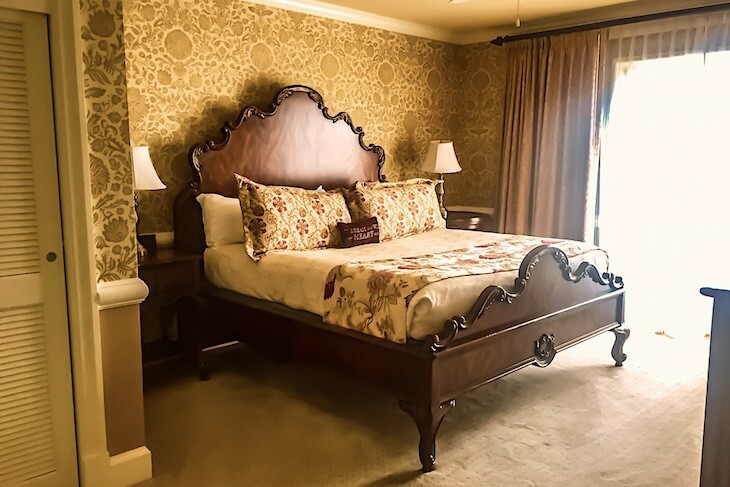 The master bedroom boasts a crystal chandelier, mahogany bed with silver trim laid with gold and green striped bolsters and gold bed runner, easy chair and ottoman, oversized wall-mounted TV, and bureau. 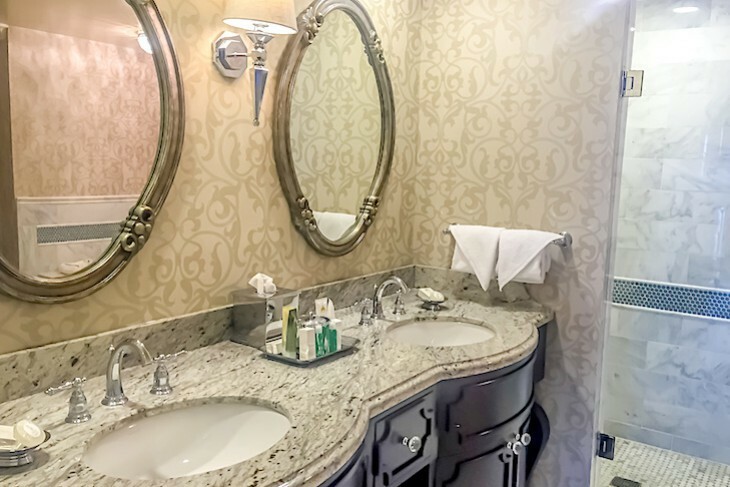 In the master bath is mosaic tile flooring, walk-in closet, oversized free-standing, non-whirlpool tub, Carrera marble shower, and a built-in makeup vanity space between the two sinks set in a taupe granite countertop. In a separate area is a bidet and commode. 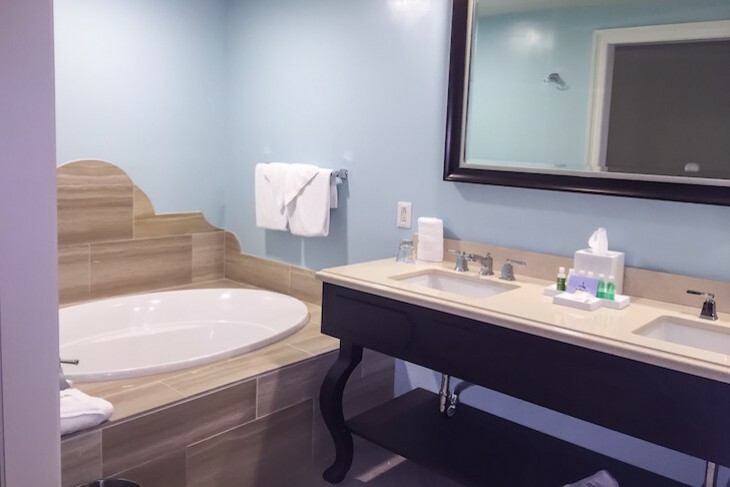 The second bedroom is standard in size with two queen beds, occasional chair and ottoman, and upgraded bedding with a somewhat Asian feel; it also offers an accessible upgraded bath with roll in shower and single sink. 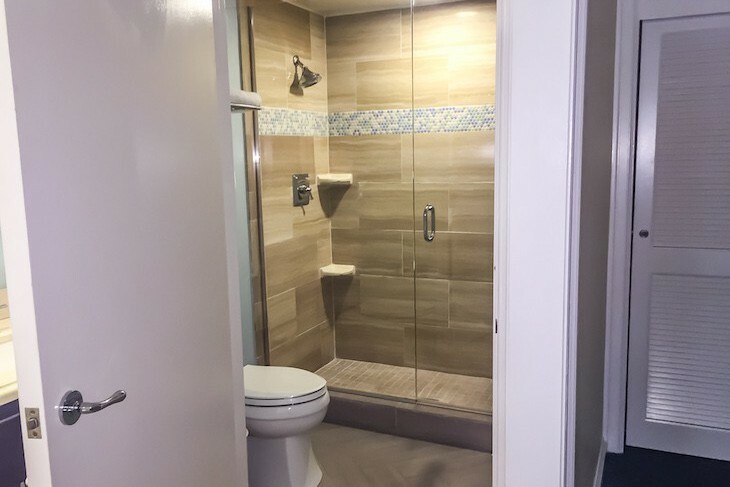 A granite and mosaic tile half bath is located off the entry.